I have become a sock knitter. I was warned when I began - it would be addictive. I wouldn't be able to stop. And I fear those warnings may be true. 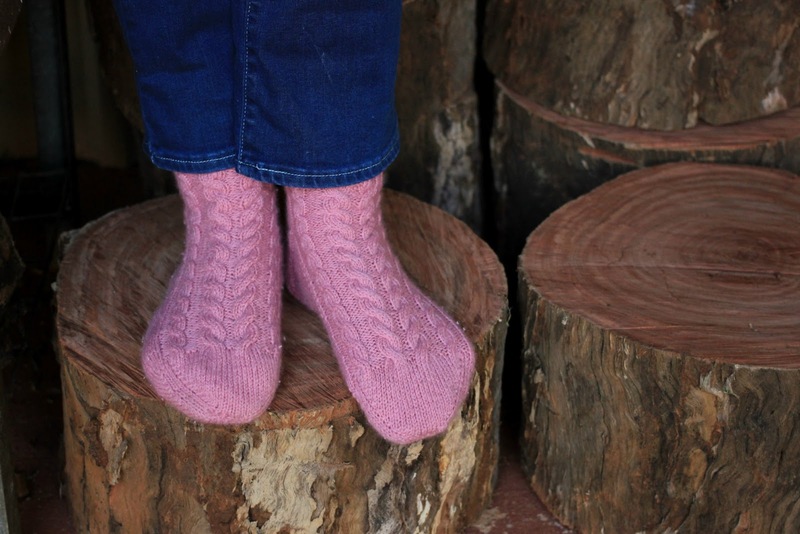 Who knew that socks would turn out to be such a satisfying thing to knit? I have knitted two pairs, and I hope to knit a few more before the year is out. These ones pictured are sort of my first pair. 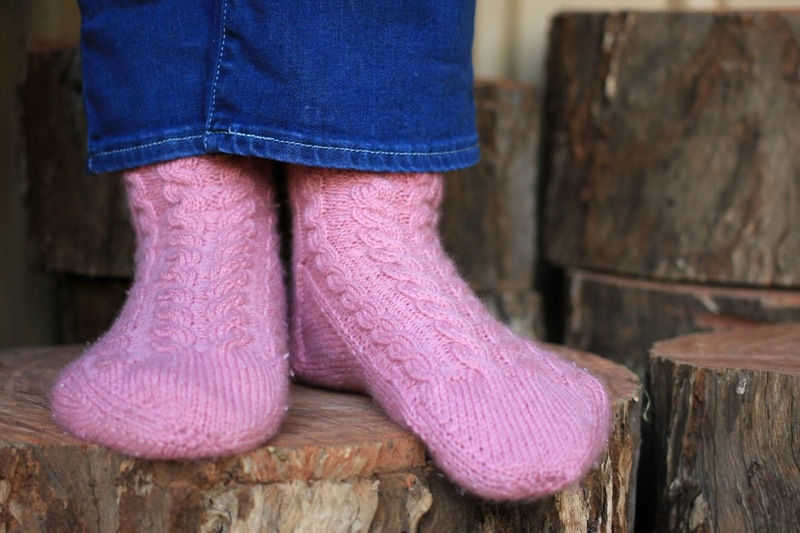 I say sort of because I completed one and a half socks before putting them aside to work on some other projects. I had birthday presents to make and some design deadlines. One of the birthday presents I made, were socks. My lovely friend Kellie and I once had a conversation about how we would both like to tackle cables and socks. She suggested I tackle both at once. 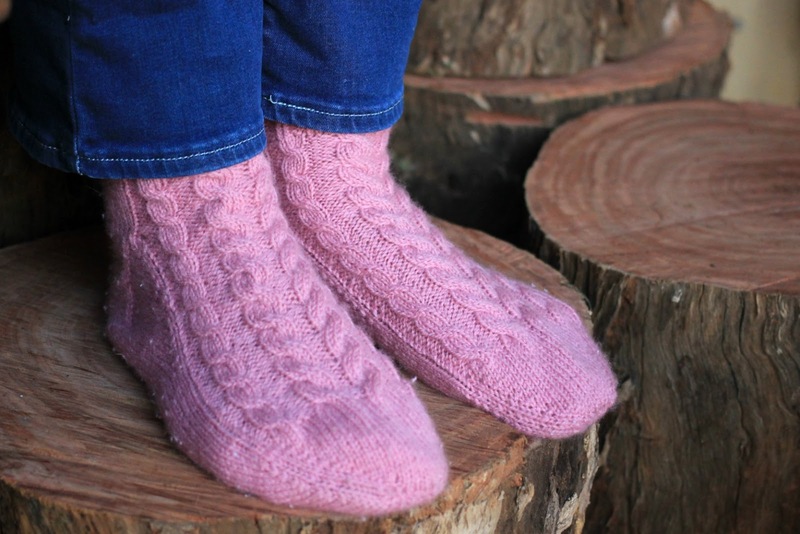 I jokingly agreed that I should, and then a little while after that when pondering what to knit for her birthday, I knew it just had to be cabled socks. Having already completed one sock and made a few mistakes on it, I wanted to knit Kellie's socks two at a time, using the magic loop method. I ordered a pair of extra long 2.25mm needles especially for the project, and if I hadn't, I don't think I would have persisted with learning to knit two at once. I googled for tutorials on how to get started and tried one written tutorial and two different videos. I attempted to cast on four times and then decided that at the rate I was going it would be faster to knit one at a time, and just hope they came out identical. So I cast on one sock. But, only a few rows in, that long cable started to annoy me. It's like every time I had to slide my stitches over that great distance it was a reminder of my failure. So I decided to try one more time. It was heading to late at night by that point, and I decided to try again in the morning. For some bizarre reason, I awoke at 4am that morning, bright eyed I might add and unable to go back to sleep. And so it happened, in the early hours of the morning, that I conquered casting on and knitting two socks at a time using the magic loop method. I ended up doing it tutorial-free, and it turns out all I needed all along was an extra needle. None of the waste yarn, multiple casting on, extra DPNs or crochet hooks involved. Just a little spare needle for one little part. 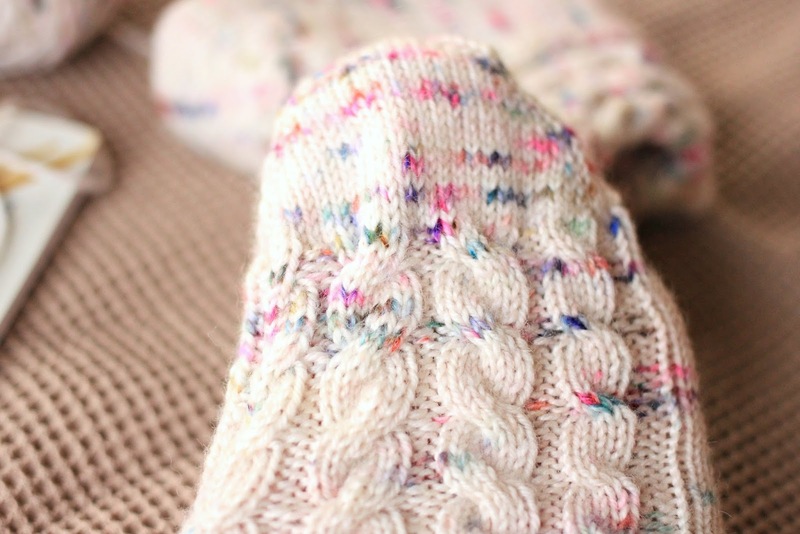 I had to unpick and re-knit the heel on one, but in the end, I worked a pair of speckled cabled socks, who ended up fitting their intended perfectly (sigh of relief! ), and turned out rather perfect. 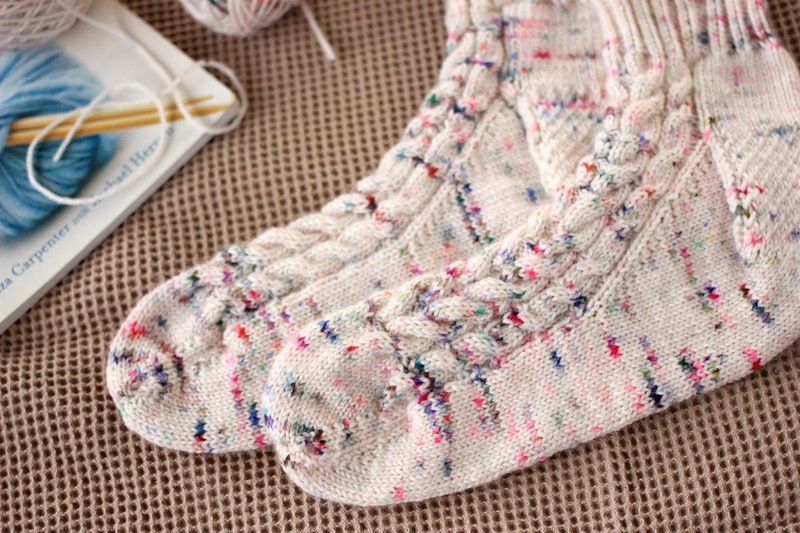 With them blocked, dried, packaged and posted I returned to my own sock and finished it off in a couple of days. My pink pair aren't perfect. One sock is pretty close to perfect, and the other is flawed around the gusset. It's a little looser around my ankle than it should be, but I'm very happy with it none the less. I've never had a pair of wool socks before, and they are lovely to wear. They are keeping my feet warm like nothing else ever has, whilst also being breathable and so light that I forget I have them on. And they even stay on my feet overnight, so I don't have to go fishing for my socks at the end of my bed in the morning or get cold toes in the middle of the night. So I've been looking in my stash to see what will be suitable to cast on as my next pair of socks. I must pick a different pattern, because as much as I loved knitting this one, after working two pairs of socks with cables and designing a cabled beanie I'm a little over the cable needle, for now. 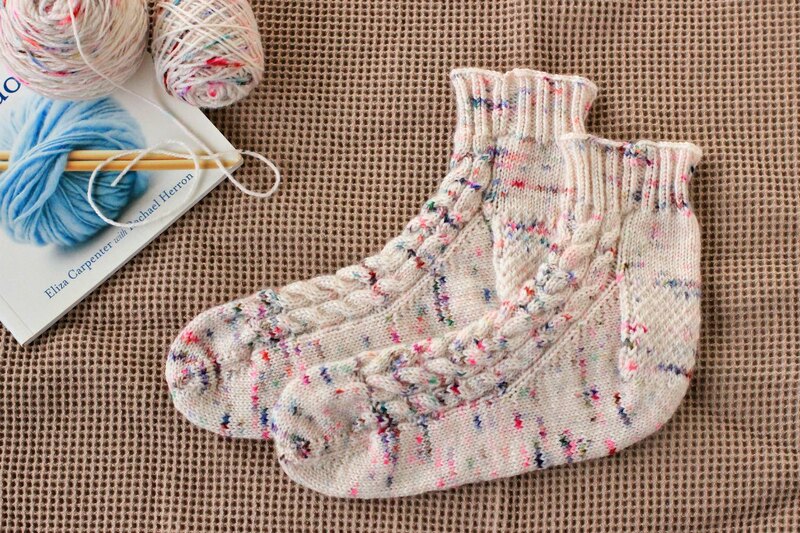 Have you ever knitted socks? Do you prefer working them on DPNs or Magic Looping? wow! As a very seasoned sock knitter I bow down to you - ha! 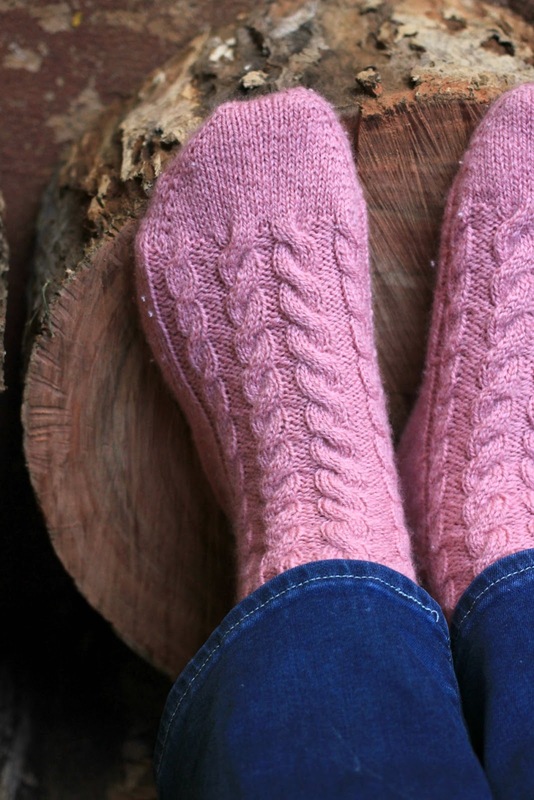 ;) I am super impressed that a) cables and b) knitting two together so early on in your sock knitting education! Well done!! I'm on a mission to knit a ton of other staff at my school a pair before I leave at the end of term 3 - I've knitted a sock in 48 hours, so am on my way (super plain with variegated wool though!). They ARE totally addictive! I love them! I've struggled through knitting one pair (no cables!). yhen I tried crochet socks, which are plain but very comfy and quick to make. Its funny how sometimes you just nee to sleep on something complex to allow your brain to unscramble it! I had no idea you could crochet socks! I love knitting socks because they're quick and don't use much yarn but I can't manage magic loop. Luckily I don't mind wearing socks that don't exactly match. Once you get addicted you'll start experimenting with different heels and toes and knit up or down. So many possibilities! You socks look great. 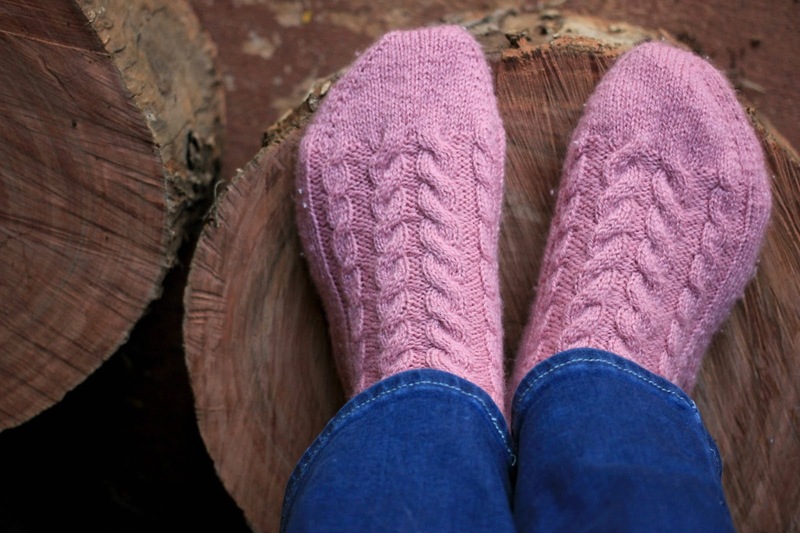 I am a plain knitter & have not been very adventuros in my knitting but you have made me feel like I want to knit a pair of socks if I can find a super easy pair to start off with. I have never tried cable knitting. I am mainly a scarf knitter but recently made hubby a beanie & I am knitting my first throw with a diamond pattern. Thanks so much Jenny! I've heard good things about the Vanilla Socks, I think it's a very basic pattern that's probably a good first start :-) Happy knitting!